When people think of Switzerland, they often think of chocolate, Gruyère cheese, watches, bank accounts, Roger Federer, the Alps, St. Bernards and army knives. But Switzerland also produces a huge range of wines from many different regions, and has done for more than 2,000 years. In 2010, I had to go to Rome for a few days and flew through Zurich, Switzerland to get there. Afterwards, before heading back to the States, I decided to return to Switzerland to inspect the wine regions, check out the terroir and sniff around a bunch of producer’s cellars. This sniffing around led me to the incredible Lac Leman. I grew up near the water and I live next to the water now. By water, I’m talking ocean, something I’ve always thought to be incredibly beautiful. But when you look out at the ocean, past the waves, past the various shades of water, you see the horizon. And unless the sun is setting along that long, vast line, there’s not a hell of a lot else to look at. While never that attracted to lakes, I recently began to realize that they can be even more beautiful than oceans, mostly because of what lies behind the body of water. With lakes, you still get the glistening, moving, liquid thing, but you also get trees, hills and, in Switzerland’s case, mountains. In short, the background completes the picture with a sense of depth. Lac Leman (as it is known to the entire world except Americans who call it Lake Geneva) is, for me, one of the most beautiful lakes in the world. It is also one of the largest lakes in Western Europe, resting between France and Switzerland at about 1,230 feet (375 meters) altitude. The lake has a crescent shape, is about 45 miles (73 kilometers) long and has a maximum width of 8.7 miles (14 kilometers). At its western tip lies the city of Geneva. Along the south lies France and the Chasselas-specialized Savoie region. To the east, past the city of Montreux, sits the entrance to the Valais. The city of Lausanne is situated on its northern edge. ​The vineyards that lie along this northern edge are part of the Vaud canton, Switzerland's second most important wine zone. The Vaud is distributed across three sub-regions: Chablais, La Côte and Lavaux. Beginning in the 10th century, monks cleared the slopes and started to cultivate vines in the Vaud. The rocks deposited by the glaciers were then used to build the stone walls supporting the terraces. Today, 818 hectares are devoted to growing grapes. The climate is moderated by the waters of the lake, which reduce spring frosts and summertime highs. The soil types change dramatically every hundred meters, giving the wines from each Grand Cru a particular identity. The slopes are fractured by the aforementioned vineyard separating stone walls. They are part of the so-called three suns of Lavaux, those being direct sunlight, the sun’s reflection off the lake, and the sun’s reflection off the stone walls. Looking up at the vineyards from the lake, not much is visible except the stone walls, but if one walks 600 meters above and looks down at the lake, one sees nothing but vines. 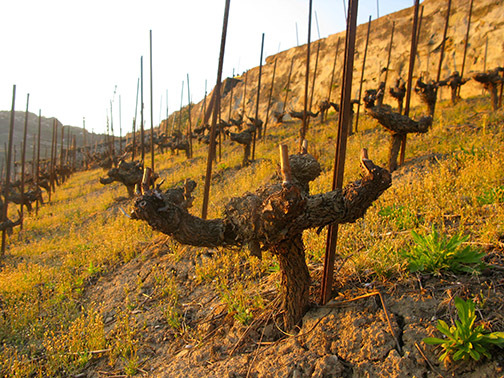 It is no surprise that these amazing vineyards, impossible to work with a machine and necessitating only human labor, are also a UNESCO World Heritage site. About 10 kilometers west of Lausanne, in the area called Lavaux, sit the Vaud’s most impressive vineyards, on soils formed some 25 million years ago. It is here that we find the region’s Grand Crus (and finest wines), including Dézaley, Epesses and Saint Saphorin, where the steep terraced vineyards plunge from hillside villages right to the edge of Lake Geneva. The highly expressive grape variety Chasselas truly flourishes in this area, supported by the Vaud’s chalky limestone soils and underlying alkaline earth. While there are several theories about the origin of Chasselas, it seems that most of them lead back to this area around Lake Geneva. Today it is the region’s most widely planted grape, and also goes by the names Perlan in the Mandement district and Fendant in the Valais. The wines from Chasselas ​tend to be medium-bodied and floral, with plenty of underlying acidity and minerality. The amount of fruitiness and minerals will depend on the terroir, but almost all of these wines are perfectly suited for the fondue and raclette of the region.